Apparently the Diocese of Leeds is in a state of “serious financial crisis”. Bishop Nick Baines is pacing the cloisters with furrowed brow, anguished about having to sell off one of his cathedrals to make up the £3million shortfall. He has earmarked Bradford, mainly because it’s not as pretty as or Ripon or Wakefield (and who needs three cathedrals anyway?). The House of Saud has already expressed an interest, provided they can make a few adjustments to the Grade I listed building. According to the Guardian, there will be redundancies, salary cuts and pension scheme adjustments. Bishop Nick acknowledges the “very difficult news” for Diocese employees: Synod members have been asked to “keep them in your prayers through this difficult time”. Yes, that’s the one he means. Moral hazard is of no consequence in the kingdom: if the bishops of Leeds (all six of them) can’t balance a budget and evangelise to swell the coffers (and save souls, of course), then the bishops of London (with assets of c£500million) should come to their rescue. That’s Acts 2 in action, you see, chiming with the episcopally-favoured economics of Marx: “From each, according to his resources, to each, according to his need.” So if Bradford Cathedral is going bust, St Paul’s Cathedral should sell off Henry Moore’s Madonna and Child or Admiral Nelson’s marble sarcophagus to help meet the needs of their poorer brothers and sisters up north. Philip North told Christianity Today there was “shocking disparity” between the dioceses, and this manifestly impacts on mission. “In ex-industrial areas there is no safety blanket,” he said. 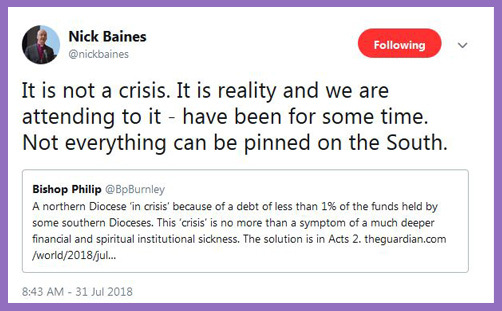 The thing is, there is no “serious financial crisis” in the Diocese of Leeds: a shortfall of £3million in one year is perfectly manageable, and Bishop Nick Baines has been on top of the operational deficit for a few years (and it’s worth bearing in mind that it’s a situation he largely inherited when his super-diocese was created in 2014, merging the diocese of Bradford, Wakefield and Ripon & Leeds). If you want to know what £3million represents in the great scheme of things, according to the Leeds Diocesan Board of Finance Balance Sheet for the end of 2017, the Diocese has fixed assets of £184million and current assets of £7.8million. That sounds like quite a thick and woolly “safety blanket”. When you subtract a few liabilities, Bishop Nick bestrides a diocese worth a very healthy £177,125,000. Now some of this is obviously property which is housing the Diocese’s 356 stipendiary clergy and so necessary for ministry and mission, but it hardly paints a picture of “serious financial crisis”. So, instead of tweet-jerking a redistributive raid on England’s wealthier southern dioceses (or calling on the CofE national bodies’ c£8billion) in order to alleviate the £3million deficit ‘drop’ in the Diocese of Leeds’ £177million sea of super-abundance, the Bishop of Burnley might look first at the Diocese’s balance sheet. If a bit of West Yorkshire pasture might easily be mortgaged or sold to alleviate a temporary cash-flow problem, why should Oxfordshire or Buckinghamshire subsidise the Diocese of Leeds to any extent at all? What’s wrong with a little means-testing? Instead of preaching the universal benefit of diocesan wealth redistribution, Bishop Philip might instead trust the sound stewardship and financial judgment of Bishop Nick Baines, whose impulse is to balance his budget – on pain of compulsory redundancies, pension cuts and reductions in salaries. These are real people’s real lives, and the decisions he takes will cause real hardship and suffering to those affected. But Austerity is necessary evil. It is heartening to know there are bishops who are fiscally faithful in the small things to demonstrate to their colleagues that the budget deficit and national debt caused by excessive government spending cannot be resolved without cuts. These are difficult decisions, of course. But living within one’s means is a moral duty. Offers of prayer for those affected, while generally appreciated, are no substitute for a foodbank.